Southern Aluminum's Swirl Tables® include a handcrafted artistry that adds an incredibly dynamic element to your interiors. The tabletop is made of anodized aluminum, etched with randomly sanded swirls and protected by a powder-coat finish. Choose from a variety of shapes, sizes and colors to customize your Swirl Table®, making any occasion an exquisite success. Perfect for banquets, lobbies or meeting rooms. Swirl Tables® bring low maintenance to high design. Cretors Mach 5 Popper is the fifth generation of the machine, and is available in 20-, 32-, 48- and 60-ounce kettle sizes. The new Mach 5 Ventless Hood Popper comes fully equipped with two heat lamps inside the cabinet, allowing for storage of fresh, crisp and savory popcorn. Also included are two halogen lights permitting increased visibility and ease of operation. The one-piece kettle design prevents oil leakage. The Mach 5 features a plastic bin liner and snap-on lid, maintaining the raw corn's freshness while protecting the food from contamination. The rust-free, stainless steel frame gives the popper an attractive appearance while creating a durable, safe and stable machine. Lil' Orbits offers automatic donut, crepe/pancake machines, turnkey packages and supplies. Profitable mini-donuts are made automatically in front of the public. Aroma, action and taste are an instant hit. Portable machines produce four sizes of donuts and carry a lifetime guarantee. New, versatile Uni-Matic II cooks crepes and pancakes on Teflon belts. With no grease, it features automatic time and temperature, all in a lightweight, portable package. The SC9000 EZ Stage is a mobile, durable, compact stage that can be simply folded up and easily rolled into storage on its wheels by just one person. When folded, the portable EZ Stage can be tucked away into a minimal storage space and conveniently retrieved and set up at a moment's notice—without any tools. The platform is simple to unfold from storage position and convert to stage configuration because of a series of linkages that are designed to transfer each half of the stage, from casters to steel legs, in two fluid movements. 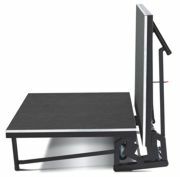 The stage platform is available in dimensions of 6-by-8 feet when set up, yet folds up vertically to 2 ˝ feet wide. Century Industries introduced a new mobile bleacher with folding sun canopy to offer sheltered spectator seating throughout the community at special events. The outdoor fabric canopy folds and stows to travel with grandstand bleacher on public roads. Based on Century's popular TranSport 10-row mobile grandstand bleacher, this breakthrough canopy cover takes mobile outdoor seating to a new level by providing covered seating for events with no time-consuming setup. Available in various sizes, seating capacities and fabric colors. Dr. Smoothie's premium fruit concentrates are the gold standard of the smoothie beverage industry. Globally sourcing only the finest vine-ripened fruits, Dr. Smoothie concentrates are made with a special blend of whole crushed fruits, juice concentrates and a super antioxidant panel of vitamin and minerals. Dr. Smoothie 100% Crushed® is available in 16 flavors and features no artificial colors, flavors or preservatives. You'll enjoy four servings of fruit in one 20-ounce smoothie.